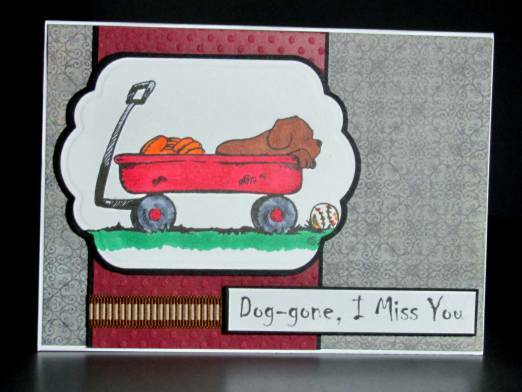 This very delightful digital stamp cried out for a very light touch. I used colored pencils in pastel tones for coloring and gave it a simple mounting. I distressed the edges of the piece, mounted to green and roughed the edges of that as well. I used 'old paper' distress ink to mute the overall tone. 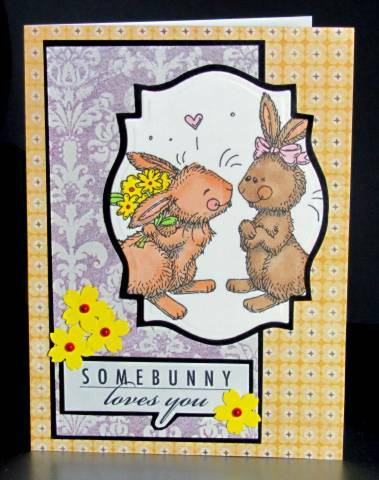 The sentiment is stamped on a yellow card, distressed edges and backed with green like the main panel. This is the last line only of a larger sentiment block. I used three blue rhinestones above the text. The butterfly in the upper left was added for design balance. It is actually two gold peel-off stickers colored with blue Copic marker. Then I layered them for more dimension. I started a new topic category for this post because I started a self-challenge to use some of the free digital images I've found around the net. I print them out on my inkjet printer which means I have to use alcohol-based markers (Copic, Bic, Spectrum, Promarkers) for coloring. I use brands interchangeably because it is a particular color I am aiming for, not support of any product line. 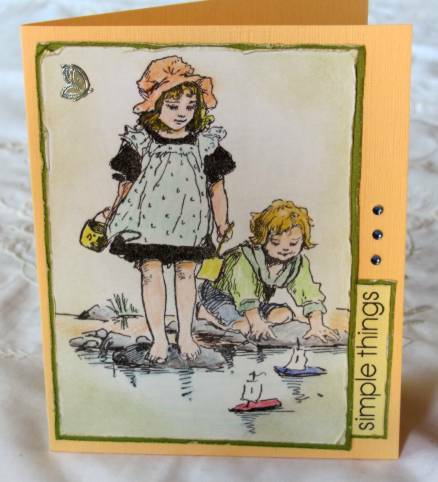 All the cards I made for this post were printed on white cardstock, colored, cut with Nestabilities Frame dies, bordered in black and layered on coordinating papers, also bordered in black. I love this little puppy in the wagon. I used somber papers to keep it on the masculine side but also to give it a little nostalgia. I popped up the puppy panel and the text on foam tape. The sentiment is produced digitally, as well, using a little pun. This one also has a digital sentimen, but with a little creative trimming. I also added some yellow punched flowers with red pearl centers to echo the flowers in the illustration. I used a diedut that allowed the image to bleed off the frame so it puts you right in the picture. For this last one, I cut it to let the illustration run off the bottom only. I found some printed paper that used the pink and blue from the illustration and then added the brown panel to match her hair. 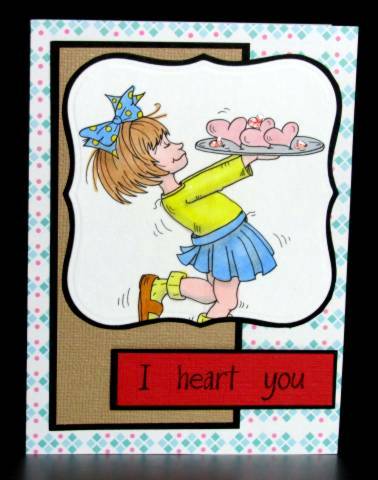 To brint the focus to the tray of hearts, I chose a rose-pink panel (that looks too red in the photo) to stamp the text. This text is made up of a set of separate words that allows you to create and stamp phrases as desired. On the tray of hearts, the darker ones are covered in Liquid Pearls.